In conjunction with Hold Stenhårdt Fast På Greia Di - Norwegian Art and Feminism 1968-89, we're exploring current feminist projects in Norway and abroad. Writer Jen Kennedy and artist Liz Linden have teamed up on an ambitious series of projects directing attention and creating conversations around current acts of feminism(s). 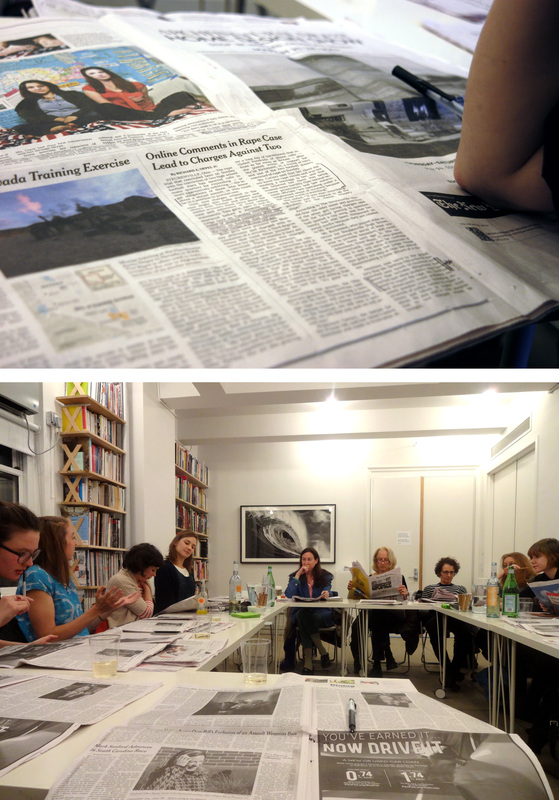 One of their ongoing projects, The New York Times Reading Group, periodically brings together a diverse group to meet and discuss that day's issue of The New York Times newspaper through the lens of contemporary feminism. 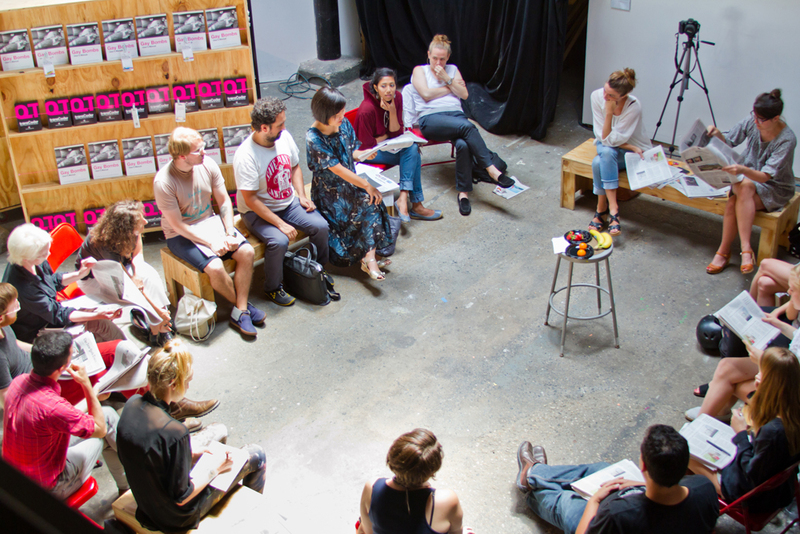 Reading groups have been held all over New York City and beyond, including venues such as DISPATCH, P•P•O•W Gallery, the New Museum, Murray Guy, Independent Curators International (ICI), EFA Project Space, and the University of Southern California. We caught up with Jen and Liz to talk about the NYTFRG, and the provocative nature of the word ‘feminism’ itself. You two have been organizing meetings and events around feminist discourse for several years. Can you tell us a little bit about your backgrounds and how you came to work together on the NY Times Feminist Reading Group? We met in 2008 while we were both attending the Whitney Independent Study Program in NY, Jen in critical studies and Liz in studio. Our collaboration began simply as conversations about feminism before, after, and between seminars. We had both attended some of the same talks and symposia on feminism the previous year and got the feeling that feminisms happening in the present tense were too often overlooked by these events that prioritized feminism as an historical moment. Our first project, Back to the future..., an experimental conversation on contemporary feminisms was an effort to talk about feminism as a lived practice with more people, publicly. The New York Times Feminist Reading Group is one of a series of attempts to get people together to discuss questions related to feminism today, questions that continue to feel urgent and compelling to both of us. What exactly is the Feminist Reading Group and how does it fit under (what seems to be) the larger project What Is Contemporary Feminism? It is important to note that we don't have a name for our collaboration; we specifically use our individual names, Jen Kennedy and Liz Linden, to attribute all of our projects, both so that it is clear that we are speaking for ourselves and also that "feminism" is not a monolithic thing, but instead a term that is specific to each individual. In other words, it is true that our collaboration and all of our resultant projects try to create platforms to explore the contemporary meanings of "feminism," but we do not have a name for the larger project overall. Our website, www.contemporaryfeminism.com, serves as an archive and presentation space for all of our projects. The New York Times Feminist Reading Group is partly a reaction against the commonly-held belief that feminist meetings, or reading groups in general, require a specific political viewpoint or specialized language to participate; we wanted to create an unintimidating platform for wide-ranging discussion that would not only entice a diverse audience to attend, but also encourage them to actively participate. Because no one can claim a particularly long-standing engagement with the material (which was published only that morning) mastery over the material or hierarchical pedagogical models necessarily cannot apply. This creates an interesting discursive environment where all participants are equally able bring their particular areas of interest to bear on their readings of the paper, since there is no “correct” comment or issue to raise. What was the impetus behind starting this project and what do you hope to achieve? One idea behind the NYTFRG is to create a really open space to discuss feminism, to get people to interact with each other’s political positions indirectly through engagement with the publication itself. Unlike most other types of more familiar reading groups, there is no common understanding of what a New York Times reading group would or should be; from someone’s first experience of the project (i.e. reading or hearing the title) the eponymous subject of discussion makes it difficult to predict what to expect. There isn’t the need for authority over the material or specialized, academic language to engage with it. The discussion is totally unpredictable and contingent on the content of that day’s paper and the people in the room. In short, it’s a reading group that abandons the general rules of reading groups. Adding the additionally destabilizing element of “Feminism” to the title further complicates the audience’s expectations for the project, and what a newspaper-based reading group might be. There are a lot of negative knee-jerk reactions to the word feminism, and yet it seems the feminist movement is on the rise in popular culture. What do you think is behind this cultural tension and recent widespread attention? In terms of the knee-jerk reaction, we specifically use the word "feminism" somewhere in the titles of our all of our projects as a provocation. In some ways, we want to mobilize and expose that reaction for what it is. While we are both pretty wary of discourses recuperating failure in artworks, I will say that in this case some of the failures we have had and the contexts where our work will not be shown, related to the titling of our work, is effectively part of the work itself. The "feminism" in the titles works as a kind of semantic Rorschach test of the institutions and participants that might engage with the projects or not. The NYTFRG has partnered with several organizations to host events, including Independent Curators International (ICI) and the Elizabeth A. Sackler Center for Feminist Art. Can you tell us a little more more about this collaboration and why you’re choosing to work with a variety of organizations? Practicality and wider, more diverse audiences. 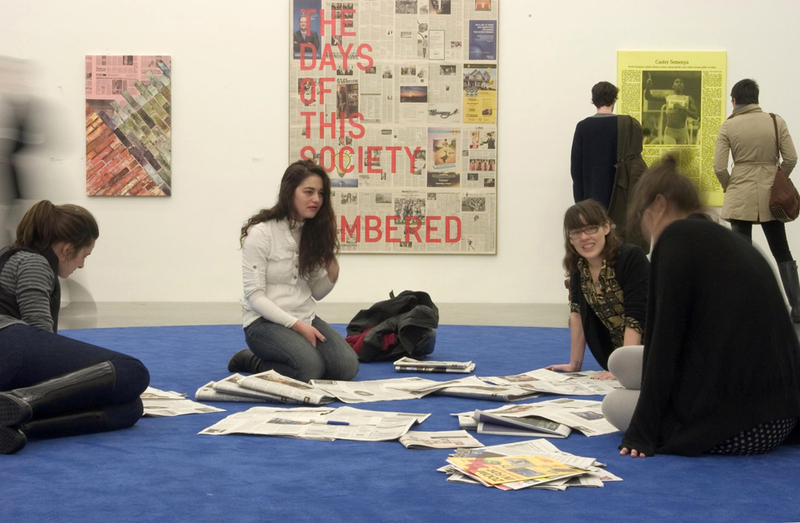 The reasons for holding the NYTFRG at different venues varies, sometimes people will reach out to us because the reading group fits with the theme of a particular show and other times we will make contact a space that has a mandate or exhibition record that seems like it would be amenable to the project. Do you have any upcoming events or projects that you’d like to share with us? and more dates TBA in the fall and winter. This year we are also making a New York Times Feminist Yearbook by collecting and scanning the newspapers that were discussed, annotated, dogeared, or otherwise marked-up during the reading groups, which will be available online and as a broadsheet publication in late 2014. Email us (contact@contemporaryfeminism.com) to be added to our mailing list and kept up to date, or visit our website (www.contemporaryfeminism.com) periodically for more information as we have it.